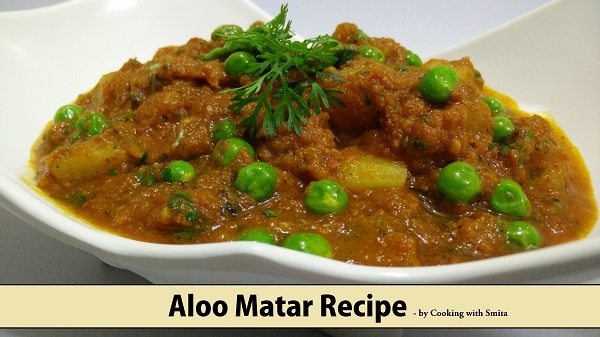 Aloo Matar is Punjabi recipe which is made from boiled Potatoes & Green Peas in a spicy Tomato based sauce. Tomato sauce is cooked with Ginger, Garlic & Onion paste with added spices. This delicious main course dish is served with Roti, Paratha or Naan. Learn how to make one of the most popular North Indian Sabzi in this recipe. Grind Onion, Garlic & Ginger and make the paste. Grind Tomatoes separately in a mixer grinder and make the puree. Heat 3 tbsp oil in a kadhai over medium flame. When oil is slightly warm, add Onion, Ginger & Garlic paste and sauté for 2 – 3 minutes. Add Tomato puree and mix well. Add all spices – Dhana Jeera Masala, Kashmiri Chilli powder, Red Chilli powder, Turmeric powder, Garam Masala and Salt. Mix well all ingredients. Stir at regular intervals and cook it for 5 – 7 minutes. After 5 minutes, taste the gravy, if it’s sour in taste (due to tomatoes), add Sugar. Add Green Peas, boiled Potatoes and mix well. Add Kasuri Methi and some water for gravy and cook for 2 – 3 minutes. Switch off the gas after 2 minutes and add Kitchen King Masala, Fresh Coriander and mix well. Serve hot with Roti, Paratha or Naan.